He came, he saw, he acted like a fool, and he rewrote the history to make himself the victim. Brazilian authorities allege that Ryan Lochte fabricated the story that he was robbed in order to cover up his own bad behavior, in a textbook example of white male privilege and American Exceptionalism. According to Brazilian officials, he and three other U.S. Olympics swimmers — Jack Conger, Gunnar Bentz, and Jimmy Feigen — allegedly vandalized a gas station restroom in Rio de Janeiro and got into an altercation with the station's security guard. Authorities in Rio also allege that, to top off their night of debauchery, the athletes urinated on the walls of the property. If the reports are true, the men literally pissed upon the country that had welcomed them — a country whose people wanted Olympics funds diverted to fix their crumbling infrastructure, their schools, their hospitals. A country whose people were instead treated to overindulged athletes who played upon the basest stereotypes of their country to concoct a dangerous lie. Ryan Lochte issued an apology statement on Friday morning for his "behavior last weekend." He does not address claims that he lied to the IOC, the media, and Brazilian authorities. He instead apologizes for "not being more careful and candid in how I described the events of that early morning." He goes on to posit an excuse for the behavior: It's "traumatic" to be out partying in a foreign country with a language barrier. He ends with a plea that "we spend our time celebrating the great stories and performances of the Games," rather than focus upon the situation. The contentious incident, Lochte's somewhat defensive apology, and the blasé response from the International Olympic Committee that followed on Wednesday (to summarize: "LOL boys will be boys") is just one of the many recent incidences of white men getting away with whatever they want with very few repercussions. But Lochte's is Cuban-American, and that only makes it more disappointing. According to an interview with NBC Miami, the swimmer's mother, Ileana, was born in Havana, Cuba, where she lived until she was seven years old. She later immigrated to the United States, first settling in Miami, before moving to New York state, where Ryan Lochte was born. Later, the Lochtes moved to Florida and settled into Port Orange, a town just south of Daytona Beach. In 2012, Ileana Lochte spoke to NBC Miami about her son's achievements in the context of her immigration status. "When he won the gold medal, the individual gold medal [in Beijing 2008] and all I could think about was what my parents went through and how he's there representing the United States, and my parents wanted us to be there so badly, to be in the United States," she said. "And to see him up there with the American flag, it was great." 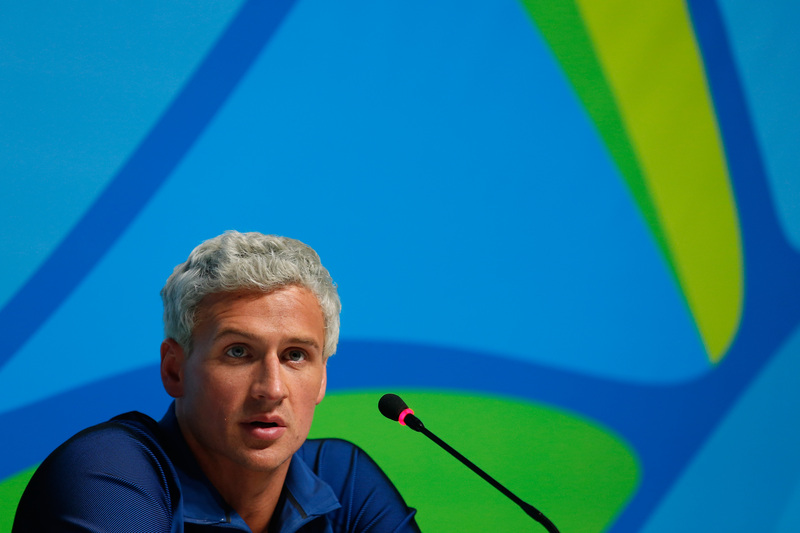 Ryan Lochte doesn't get a pass on white privilege because he's Latino, though. No question about it, blue-haired dude-bro has white privilege in spades. You probably didn't even know he's Cuban-American, since it's not apparent in his appearance or his skin color or his name. Even if he is technically Latino, he appears to be white and so the world treats him as such. So what does it mean to have white privilege as a Latino? It means he meets the white standard of beauty. It means he won't be questioned about his immigration status. He won't be the target of racist assaults. He won't be unjustly targeted by police officers because of the color of his skin. There are countless ways in which he benefits from his white skin. Lochte is a white Latino, which doesn't excuse his actions, but instead, makes them infinitely more disappointing. He's been given an incredible platform to speak on behalf of Latinos and POC who don't have his privileges, and instead he's squandered that opportunity. Simone Manuel, the first African-American woman to win an individual swimming medal at the Olympics, has openly discussed what it means to be standing on that stage, gold medal around her neck, as a black woman. "It means a lot," she said. "Especially with what is going on in the world today, some of the issues of police brutality. This win hopefully brings some hope and change to some of the issues that are going on. My color just comes with the territory." It was unspeakably refreshing to see Manuel speak about her race so candidly, especially because swimming pools have historically been an anti-black space. Just last year, a police officer in McKinney, Texas, wrestled a young girl to the ground after she and a group of black teens caused a "disturbance" at a community pool in a predominantly white, upper-middle class neighborhood. Given swimming pools' racist history, it's unsurprising that 60 to 70 percent of African-American and Hispanic children can't swim, according to a study commissioned by the USA Swimming Foundation. To see black women like Manuel winning gold medals in swimming is especially important when you consider these facts. But look at that stat again — it's not just about African-American kids; it's about Latino kids, too. Lochte has acted as a cornerstone of USA Swimming's Hispanic outreach in the past. He has spoken about his Latino identity whenever asked (he spoke about his Cuban-American heritage to me once, while I was on the staff at Latina magazine), and his mother has also spoken about their Cuban background to multiple news outlets. (She recently shared his favorite Cuban dish with Today.) He has never made any obvious moves to hide the fact that he's Cuban. In fact, he seems to occasionally embrace it. But he hasn't really done anything to help the Latino community, either. Like Manuel, he had a huge opportunity to embrace his identity in all its facets: to stand up and say that he wants to be a role model for Latino kids who don't know how to swim; that he wants to help change the systems that prevent people without his privilege from pushing toward their dreams; that he's angry, discouraged, disappointed by the hate throttled toward POC in America. But he didn't. He hasn't. And it's a wasted opportunity. Instead — if the allegations against him are true — he used his white passing privilege to spit upon the hospitality of the Latino nation that embraced him and his teammates. He used his white privilege to mar the reputation of the Latino peoples who welcomed him, despite their reservations. If true, his actions are inexcusable, disgusting, horrifying. But his actions are also frustrating, because his Cuban-American heritage adds another question to the equation: What if? What if he'd done better? What if he'd been the kind of athlete who could inspire other Cuban-American and Latino children to jump in and learn to swim and race their way to the Olympics? Few athletes have the name recognition of Ryan Lochte and few Latinos have his level of privilege. He could have made a difference, and that's what makes his actions all the more disappointing.